Following the cartridge games crash in the early eighties, Sierra was on the brink of bankruptcy when IBM approached them with a proposal. 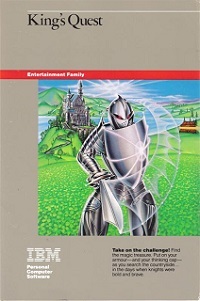 IBM was developing the IBM PC Junior and wanted Sierra to develop a game that would demonstrate the new computer's superior capabilities when it would be showcased in early 1984. In an era where it was common for computer games to be written by a single person over a matter of weeks, King's Quest was one of the most ambitious, risky, and costly projects of its time. An entire team reportedly worked for 18 months to complete the game at a cost of more than $700,000. Notably, King's Quest was the first fully colored 3D adventure game to have animated characters instead of static pictures. 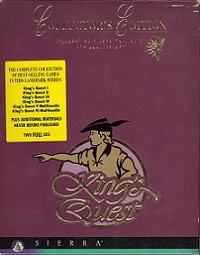 King's Quest was the first game to apply the Adventure Game Interpreter (AGI). Due to the PCjr's poor reception, King's Quest did not sell very well at first. A year later, Sierra released versions for the Tandy 1000 and standard PCs, which at last made the game a tremendous success. The game started a whole new era for Sierra On-Line, the golden era of adventure gaming. 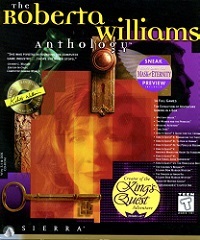 King's Quest became Sierra's most successful series, of which each game was written and designed by Roberta Williams. The game was re-released for DOS in 1987 using Sierra's updated AGI V3 engine. It was also ported to the Amiga and Atari ST at the same time, and eventually to the Sega Master System. 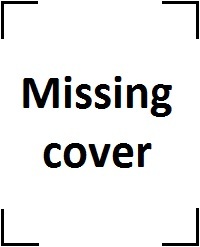 It also was included in several collections. King's Quest actually has its roots in 1980 from Hi-Res Adventure #2: The Wizard and the Princess, the 2nd game ever published by Sierra when the company was still called On-Line Systems. Interaction Magazine, Fall 1994, confirmed in an article that "Wizard and the Princess" can be considered the prequel to King's Quest I. Wizard and the Princess takes place in a country called "Serenia", visited by Graham in King's Quest 5. It is widely believed that the main characters of the Wizard and the Princess are related to characters in King's Quest. The Wizard is related to the wizard Mannannan (KQ3) and Mordack (KQ5), which are all members of the "Black Cloak Society". The princess was the Queen who died of illness in the prelude story of King's Quest 1, and the hero of "Wizard and the Princess" (known as the Wanderer) is the old king in King's Quest 1 himself. 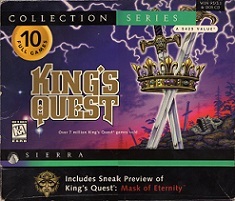 King's Quest 1 was re-released in 1990, using Sierra's SCI engine. Other 3-D animated adventure games were later also remade in SCI but with VGA graphics. Fans from AGDI (originally known as Tierra Entertainment) also remade the King's Quest 1, using VGA graphics and voice actors, including Josh Mandel who revisited his role as King Graham.